Ficaram lindinhos, minhas filhas gostaram. They even kept what you said about your 9yo son in the post about the knit minecraft creepers. Hope you can sort this out, let me know if I can help. I'm going to see if I can report them to blogger or something. I've put in a report to google, and they got back to me. Unfortunately they want a list of each and every url where my posts have been copied, and there must be a couple of hundred. It's a humongous task!! It also looks as though the site isn't just scraping posts from here. 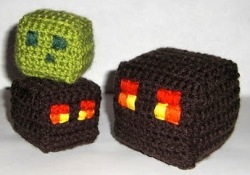 There's at least one other amigurumi blog I recognised posts from & I've let the author know. The only good thing is that the site doesn't seem to rank at all on google search, so for now maybe it's not worth the effort to pursue. I'll have to put some serious thought into it. Thankyou so much for letting me know, and I'll keep in touch if anything new comes up. Hi there, I'm sorry I was just wondering if I could submit my own patterns? If you'd like to email me with the ones you'd like to share, I'll get to it!